So Ireland has voted to #keepthepoet and take blasphemy out of the constitution. Miggeldy will have another seven years in the Aras. For any non-Irish readers I should explain, Miggeldy is the president of Ireland, Michael D. Higgins. Miggeldy is an affectionate pet name for this president used widely by Irish people after a child’s school essay misspelling his name went viral some years ago. The name is a joke on how the president has been referred to for years, especially in the West of Ireland, as a popular left-leaning politician and minister. 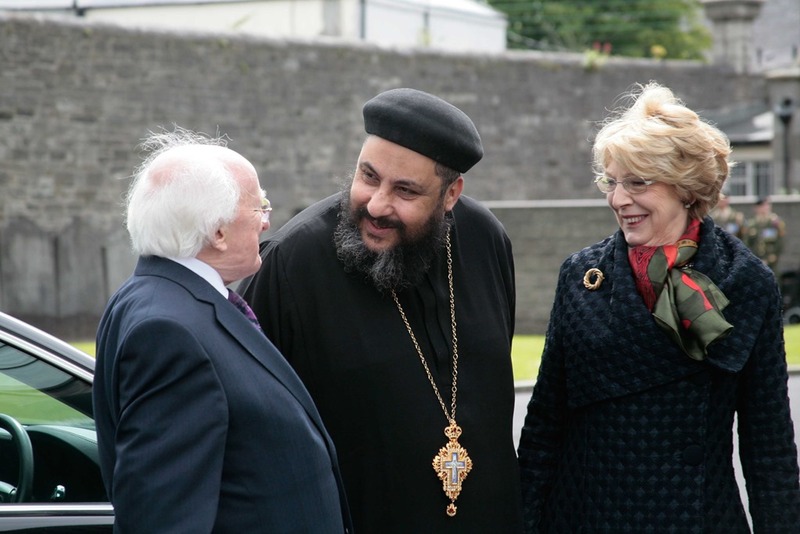 Back then he was universally known as Michael D. rather than as Minister or Deputy Higgins. It’s fitting for someone who has spent his entire career arguing for equality and fairness. Michael D. was the politician everyone would stop on the street to say hello to. Miggedly is the president who loves his dogs and is immortalised in a popular tea cosy. He’s also the president who had a pleasingly humanistic inauguration ceremony the first time round and who’s official speeches have made me repeatedly proud of one of my countries on a regular basis over the past seven years. Since Mary Robinson took the job back in 1990 the Irish presidency has become a very aspirational role. The presidency was where the Irish people could try out new ideas for size. There have been two female presidents but no female Taoiseach for example. Seven years ago Ireland could have had their first openly gay president in the shape of Senator David Norris but instead voted for their first humanist president, someone who’s further left than the majority of TDs. Michael D. was elected before Ireland’s historic referendum votes in favour of marriage equality and to remove the 8th amendment banning abortion. The winds of change might have already been blowing but once again, it was the presidency that tried out the idea to look for a fit. I’ve often thought that in recent years the presidency has become the face Ireland wants to show the world, a “good room” in human form to be brought out for visitors and kept under plastic covers the rest of the time – and we’re almost back to tea cosies. This election campaign has been a bit extreme though. Coming so soon after the abortion vote it was always going to be. That vote revealed a lie that had been told to liberal Ireland for a generation – there are more of us than you. That vote proved the lie and gave a breakdown. Of course there are complexities in any vote result, a variety of reasons why people may vote this way or that, but the abortion vote, like marriage equality before it, showed the breakdown to be somewhere in the region of a 60/40 split. You see Ireland, like many other countries has always had two faces. There is conservative, Catholic Ireland – the country of greys and blacks, right wing, dogmatic tendencies and an ultra Catholic tone – and there’s liberal Ireland – the land of saints and scholars, dark cynical humour, dazzling discoveries. These two countries have always existed in theory. In practice Ireland as she really is is a balance of the two. The question is always what is the balance. It’s the balance we glimpse in referendum results. Divorce in 1992 told us it was 50/50. Since marriage equality we know it’s shifted a bit but you can never be certain. So when it was announced that Miggeldy was in fact going to seek a second term (he had always said he would only do the one) they all came out of the woodwork. That’s how there were early stories about famine theme parks and anti-vaxxers and Dragons Den. Actually it all got very odd. In the end there was only one other contender. Peter Casey managed to garner around a third of the vote by dog whistling anti traveller sentiments and being generally reactionary. The last 24 hours have seen a flurry of articles explaining that Casey is not the Irish Trump. He’s not – but his comments about travellers did appeal very neatly to that section of Irish society who are reeling from discovering that they don’t have 50 % of the vote anymore, that they are now in the minority. They didn’t vote for Miggeldy the first time round, they didn’t vote for marriage equality and they didn’t vote to repeal the 8th. That lot have always been there, they just can’t say they’re in the majority anymore. It isn’t that long ago when Casey may well have won. This isn’t a sign that Ireland has a growing rump of right wing sentiment, it’s just an indication of where they are. Which brings me to blasphemy. As well as the presidential election there was also a referendum on whether or not to remove “blasphemous” from the statement “the publication or utterance of blasphemous, seditious or indecent matter is an offence which shall be punishable in accordance with law.” This hadn’t been a major problem until 2009 when a clause on blasphemy was added to the Defamation Act, thus defining it in law. Now it might have been a pretty useless law that was ultimately unprosecutable but it was still put in there. It seems to have just been there to catch out comics with Tommy Tiernan inadvertently triggering the damn thing in the first place and Stephen Fry falling foul of it and ultimately setting the ball rolling to get rid of it. Well kind of. Most of the coverage of this blasphemy referendum has referred to the Irish people voting to remove the law on blasphemy. They’re not. The law will still stand but at least now politicians can no longer argue it’s a gap that needs filling and hopefully speedily remove the clause from the Defamation Act. So having Miggeldy for another seven years is a good thing. Having further confirmation that liberal Ireland is still in the majority is a good thing – even if there is still a third of the population who would vote hard right conservatism. Given Ireland’s history this is actually a pretty good figure. There’s still a very long way to go but at least Ireland has decided to put a progressive face to the world.